In 1924, the World Centre of the Lahore Ahmadiyya Movement completed the construction of a mosque in Berlin. It was the first mosque to be built in Continental Europe in the modern era. A message of peace, harmony, inclusiveness and love was disseminated from its pulpits. Many notable scholars including Einstein and other Nobel Laureates visited the mosque. The mosque became the hub of all important literary and intellectual activity, producing the first translation of the Holy Quran into German by a Muslim, the monthly magazine Moslemische Revue and much other literature. The mosque would be visited by notable Muslim scholars and leaders. It is unique in that during World War II, a lady called Amina Mosler kept the mosque open and functioning. When the Russian army started shelling the mosque she nailed a piece of red cloth to a stick, raised it high and ran towards the Russian guns that were firing towards the mosque. The Russians took this as a sign of peace and stopped firing. Though damaged, the mosque survived and after the war returned to its teachings of peace, tolerance and love. It needed major repairs in order to regain its Taj Mahal-like beauty. Some years ago, the World Ameer of the Lahore Ahmadiyya Movement initiated a project for the complete renovation of the mosque and its compound, which are now listed buildings. 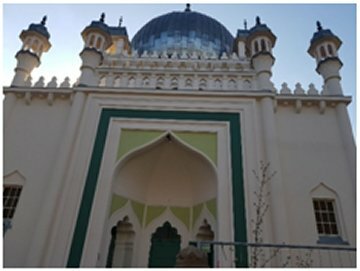 The work on the restoration of the exterior was eventually completed and the World Ameer of the Lahore Ahmadiyya Movement, His Holiness Dr Abdul Karim Saeed, has reopened the mosque and rededicated it to the mission of establishing peace between religions and communities. 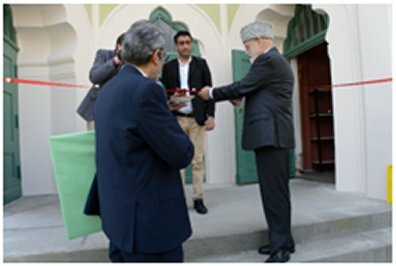 Representatives of the Roman Catholic Church, the Church of Denmark, the Jewish community and other religious bodies were present and presents were given to the mosque as a gesture of goodwill. A tapestry which took a year to make by hand was presented by the Muslim community. Members of the Church of Denmark and the World Ameer planted a rose bush to represent the beauty and fragrance of love and friendship between the Church and the mosque. The gathering ended after dinner with a prayer to Allah from those present to help grow the seed of love into a strong and evergreen tree. May Allah accept our dedication of the Berlin mosque to this noble task.